DVD Savant Blu-ray Review: Tora! Tora! Tora! Starring: Martin Balsam, So Yamamura, Joseph Cotten, Tatsuya Mihashi, E.G. Marshall, James Whitmore, Takahiro Tamura, Eijiro Tono, Jason Robards, Wesley Addy, Shogo Shimada, Frank Aletter, Koreya Senda, Leon Ames, Junya Usami, Richard Anderson, Kazuo Kitamura, Keith Andes, Edward Andrews, Neville Brand, Leora Dana, Susumu Fujita, George Macready. Cinematography Osami Furuya, Sinsaku Himeda, Masamichi Satoh, Charles F. Wheeler. Special Effects L.B. Abbott, Art Cruickshank, A.D. Flowers, Greg C. Jensen, Howard Lydecker, Glen Robinson. Art Direction Richard Day, Taizoh Kawashima, Yoshiro Muraki, Jack Martin Smith. 1970's Tora! Tora! Tora! remains the most satisfying movie about the 1941 sneak attack on Pearl Harbor. Michael Bay's Pearl Harbor is now a fixture on cheap cable stations, but Richard Fleischer's earlier version of The Day of Infamy is the one that sticks. A good parallel is Roy Ward Baker's 1958 A Night to Remember: it's still the go-to show for a gripping account of the sinking of the Titanic, despite James Cameron's blockbuster 1997 version. Although its thrills were state-of-the-art, Darryl Zanuck's road show attraction was not considered a success, unlike Fox's other big war picture from the same year, Patton. The reasons for this have been debated at length. Seen now, Tora! Tora! Tora! plays as an exciting, suspenseful and unusually conscientious examination of the terrible misjudgments that left the Pacific fleet wide open to annihilation by the Japanese Navy. Events leading to the debacle are outlined in docudrama detail. As diplomatic efforts to deal with Japan break down, Navy and Army intelligence officers Alvin Kramer and Rufus Bratton (Wesley Addy & E.G. Marshall) race against time to get complacent U.S. officials to acknowledge telltale signs of an imminent attack in the Pacific. Washington expects trouble but erroneously assumes that the Japanese cannot possibly strike at Pearl Harbor, the home of the Pacific Fleet. Top commanders in Hawaii Admiral Kimmel (Martin Balsam) and General Short (Jason Robards) are kept out of the loop of classified information; their poor decisions add to the general lack of preparedness. Nobody realizes that an elite corps of Japanese fliers has been training for months in new shallow-water torpedo attack methods, and are part of a large Naval strike force nearing Hawaiian waters. Producer Elmo Williams and producer-director Richard Fleischer had little trouble obtaining full Navy cooperation to shoot their epic, after Darryl Zanuck's grandly positive The Longest Day of eight years earlier. Anyone watching Tora! Tora! Tora! will be impressed by its amazing production values. Made long before the advent of Computer Generated Images, every shot was staged just as shown, often on the original Hawaiian locations. Squadrons of real airplanes were assembled, and more mocked up in fiberglass, including P-40 fighters and B-17 bombers. Navy trainers were outfitted to resemble Japanese Zeroes and torpedo bombers. 1970's Pearl Harbor hadn't changed much since the day of the attack, so Elmo Williams' unit, including A.D. Flowers' crack physical effects team, moved onto Ford Island in the middle of the naval base to create their magic. 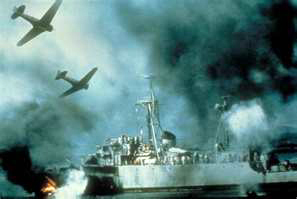 The attack was filmed with real planes and ships, full-scale mockups and excellent miniatures; many matte paintings are nearly undetectable. The shooting was long and problematic despite military cooperation. In addition to detonating giant pyrotechnics in the middle of a high-security naval base, Federal and local aviation laws frown on the idea of flying ancient aircraft over populated areas. Some of the effects work definitely got out of hand, as when a gust of wind turned a fiberglass P-40 -- rigged to explode -- directly into a group of panicked stuntmen. That shot and several other risky-looking scenes made it intact to the final cut of Tora! Tora! Tora! Zanuck and Williams had filmed The Longest Day using a German director for the German scenes, allowing German actors to speak in their own language. Tora! Tora! Tora! does the same, although the original directing choice Akira Kurosawa was almost immediately replaced by a pair of young go-getters, Toshio Masuda and Kinji Fukasaku. The Toei Company co-produced, building a giant mockup of an Imperial aircraft carrier on a Japanese beach. In the cast list, Japanese names alternate with American, a smart move to ensure fairness all around. Tora! Tora! Tora! gives the average war movie and war history buff much to argue over. The film shows little evidence of tampering for content, and the American side of the story is critical of almost everyone connected to Pearl Harbor and the Department of Defense. Crucial information is kept in tight classified circles, leaving field commanders without a clue as to what is going on. Poor Kimmel and Short are dressed for Sunday golf when the bombs start falling. In Washington, the two intelligence officers on the case find their "imminent danger" alerts held up by political waffling, inept communication and insufficient follow through. Commander Kramer complains that top Army officials are withholding vital information from the President. Pearl Harbor could have been given almost an hour's notice of the impending alert, but incompetent signal clerks dispatched a crucial message through ordinary telegram channels. Immediate comparisons arise with the 9/11 attack that occurred just three months short of sixty years later: the system is a mass of uncooperative, competing spheres of secrecy. Complacency and negligence reign supreme. Washington hasn't changed much. The Japanese side of the attack invites more uncomfortable comparisons. The Japanese have rationalized their bald aggression as economically necessary to gain access to vital raw materials, including oil. The brutal invasion of China and Southeast Asia is given a semantic nosegay called the "Co-Prosperity Sphere." General Tojo actively ignores peaceful options and pushes through plans for an unprovoked attack, even when his top commander is convinced that war with America is certain suicide. The military leaders carrying out the mass attack think only of glory and careers. Their plan is outrageous, unthinkable and brilliant. Of course it will work. This makes the actual attack, which claimed roughly the same number of lives as 9/11, particularly traumatic. We have an intense sympathy for the doomed sailors and fliers trying desperately to fend off the Japanese planes, but we're also impressed by the daring nerve and skill of the attackers. The Americans respond as best they can, trying to minimize the damage inflicted. Interestingly, the Admiral in charge of the Japanese force loses his nerve, convinced that the perfect plan will backfire at any moment. With the Americans unable to resist, he illogically cancels the follow-up air strikes to destroy dry docks and supplies of fuel oil. Because of this the Navy was able to repair most of its ships in record time. Much more crucially, the Fleet lost almost none of its fuel supply. It would have taken months to bring fresh stocks from San Diego. The Japanese could easily have immobilized our Fleet for half a year. Although the film partly exonerates Commanders Kimmel and Short, it doesn't excuse their head-in-the-ground complacency. Both are unhappy peacetime administrators too quick to underestimate the enemy. Nobody realizes that the Japanese have taken Naval warfare to the next level. Kimmel dismisses the possibility of a torpedo attack at Pearl even though the British successfully used shallow-depth torpedoes against the Italians at Taranto. The movie paints a positive picture of Admiral Halsey (James Whitmore), a later great hero who was sort-of impersonated by John Wayne in Otto Preminger's In Harm's Way. The role of Japanese sabotage is not addressed, although the Imperial Navy was getting accurate information on ship dispositions from a network of spies. 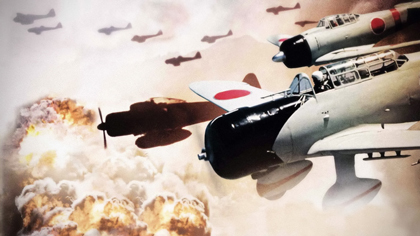 Howard Hawks' jingoistic Air Force falsely implied that much of the success of the attack was the work of Japanese saboteurs, a charge that helped inflame hatred of Japanese-Americans during the war. The movie gets in an anti-conservation dig by emphasizing that a bird sanctuary held up the crucial Oahu radar installation. But General Short didn't take the radar spotters seriously anyway. At a Saturday night dance party, older Navy wives (presumably non-actors and perhaps the wives of real Navy officers) obligingly recreate reasonable period hairstyles. Not so the 20-something girl at the bar, who appears ready to dance on Shindig. Japanese film fans can see which mature male actors had clout in Tokyo; just about the entire stock company of Kurosawa regulars are here. The actor playing Ambassador Nomura (Shogo Shimada) uses his own voice in Japanese. When he speaks in English he's dubbed by vocal artist Paul Frees, terribly. This brings us to the final argument: Why wasn't Tora! Tora! Tora! a runaway success? Americans love big war movies, and this one is more spectacular than most. Some contemporary reviewers said the film was dramatically boring, that it had no leading players to root for and no drama outside of a history lesson. This complaint has some merit, as much of the film's dialogue is bald exposition. Zanuck had ensured that his The Longest Day would be a hit by imposing dozens of little dramas enacted by a long list of guest stars. Those scenes are now the weakest part of that movie. The docu-drama narrative style is still the right way to tell such a sprawling story. Unless you've come to see a parade of name stars, Tora! Tora! Tora! now plays much better than the D-Day picture. 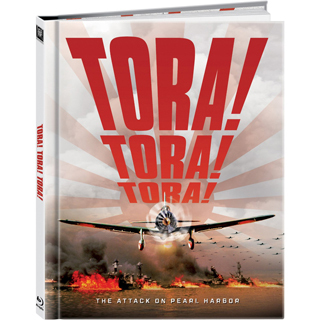 For a movie that reportedly cost $25 million dollars, Tora! Tora! Tora! has no coherent "look" of its own and settles for drab semi-realism. The lighting is high key and flat-lit, and Richard Fleischer's blocking of dialogue scenes looks studio-bound. Interiors offer few textural clues to make us feel we're anywhere but on a movie set. This is not to say that Tora! Tora! Tora! should have been in grainy, handheld B&W like Battle of Algiers, but the the dull look doesn't contribute to its documentary-styled screenplay. But those arguments are not really what kept audiences away. 1970 was the year that America avoided "square" Hollywood product and instead played their LPs of Woodstock. Kids disenchanted with the Vietnam War and Nixon were far more likely to see M*A*S*H a second time than watch yet another movie about how Dad won the last war. So scratch the youth market. Even worse, Tora! Tora! Tora! is a downer movie in a market that preferred rah-rah happy endings. Older folks that lived through the events were upset about the eroding national image, and had a diminished interest in seeing a movie where America is so soundly beaten. Even The Alamo offers its own version of Holy Glory after its finale of doom; Tora! Tora! Tora! ends in almost total defeat. No wonder the makers of Pearl Harbor distorted history by grafting on the Doolittle Tokyo raid as a fourth-act closer. Even in 1970, we generally wanted our entertainments to be uplifting. I'm sure that when attendance dropped off, many exhibitors re-booked The Sound of Music to fill in. Finally, we can't forget that in 1970 there was still a great deal of residual resentment from the war. On a psychological level, seeing Asians cheering "Banzai" as they defeat Americans didn't feel right, especially if one had a relative fighting in Vietnam. Timing is everything but it's possible that there would never have been an optimal time for Tora! Tora! Tora! in America. On the other hand, it's obvious why the movie was a breakout success in Japan. The movie ends with a reverential shot of the Imperial Naval commander Yamamoto. Fox's Blu-ray of Tora! Tora! Tora! looks fantastic. The visuals are greatly improved with the added resolution of HD -- since most of the shots are not optical effects but views of real planes flying low through smoke and flames, the feeling of realism is much greater than CGI work. The encoding of the feature is, well, gorgeous, with brighter color than I remember on previous discs. Anyone that has visited Hawaii will feel a physical chill of recognition as the dozens of Japanese attack planes fly in formation between green mountains and over vast pineapple fields. Paced in a book-like package, the disc contains a second encoding, or rather, a branching option to play the Japanese version of Tora! Tora! Tora!. This alternate Japanese cut clocks at just under four minutes longer. The one scene that's easy to spot is a comic exchange between two Japanese cooks, over the meaning of the International Date Line. I am told that the other scene is a brief strategy talk among Japanese officers. The Japanese cut may have other superficial differences I did not detect. Some reports say that the title sequence is edited slightly differently. The titles are in English, just as in the standard American theatrical cut. 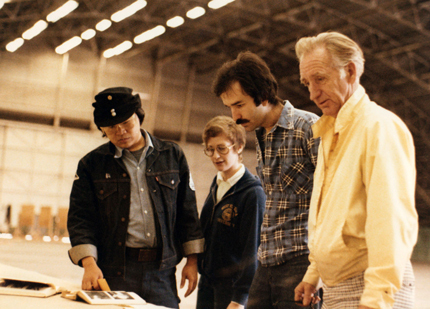 Miniature Supervisor Gregory Jein, propmaker-artist Michael C. McMillen and Effects Supervisor A.D. Flowers, ten years later on 1941. Fox Video's packaging includes an approx. 24-page souvenir booklet with many images of the miniature effects crew at work, some of which I've never before seen. A.D. Flowers won an Oscar for Tora! and later got the nod to create all the practical full scale effects for 1941, which was also Oscar-nominated. I didn't catch a picture of A.D. but I do believe I see one of Bill Myatt, a friendly Texan tough guy who fabricated the film's dozens of Fiberglass P-40 mockups. The Blu-ray extras include everything from earlier DVD special editions. Writer and Japanese cinema historian Stuart Galbraith IV interviews the late director Richard Fleischer on a commentary track, asking good questions and eliciting uncommonly detailed answers on what may be the director's most expensive film. The 20-minute academic docu Day of Infamy uses maps and photos to sketch the basic context of the Pearl Harbor attack. An original trailer is also present, along with the AMC Backstory show on the filming of the movie, more trailers and a behind-the-scenes still gallery. History vs. Hollywood critiques the film's historical details. The best extras are ten Fox Movietone newsreel clips from WW2 and after. We're shown the first post-attack public newsreel, which for security purposes is limited to views of Honolulu civilian areas. Later on, the War Department authorized the full breadth of actual attack footage for another newsreel. The famous shot of the Arizona exploding is more intact here than anywhere; It looks as if the cameraman took his finger off the trigger just for a second and caught all but the first frame or two of the main blast. Subsequent newsreels cover the Doolittle Bombing raid on Tokyo. It's a shame that these very impressive, historic newsreels weren't given a commentary to offer further context. Want to explain to your children how America stumbled into a World War by getting its nose bloodied? Tora! Tora! Tora! is just the ticket.